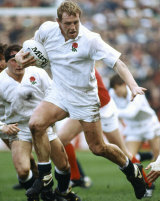 Dean Richards is a former England and British & Irish Lions No.8 who was regarded as one of the world's best players in his position with the ability to read the game and he also had extraordinary pace for a back-row forward. He will often be remembered not just for his great teamwork but for his scruffy appearance on the field with his shirt un-tucked and his socks down by his ankles. He joined Leicester in 1982 after a brief spell with French side Roanne and went onto make his England Test debut in 1986 against Ireland marking the occasion with a brace of tries in a 25-20 win at Twickenham in the Five Nations. The next year he played in his first of three World Cups for England in New Zealand. In 1988 he won the league with Leicester but the most 'memorable' moment of that year was his 'football skills' used on the Calcutta Cup after a 9-6 victory over Scotland at Murrayfield in the Five Nations. Richards and Scotland's John Jeffrey played football with the famous trophy along Princes Street in Edinburgh after a night-out following the game and Jeffrey was banned for six months but Richards escaped with a one-match ban from the RFU. The next year he was selected for the British & Irish Lions tour of Australia playing in all three Tests as the tourists won the series 2-1. Richards had a mixed year in 1991 when he won the Grand Slam with England but disappointment followed when he represented England at the World Cup but was controversially dropped after a pool stage victory against the USA. The following year he won a consecutive Grand Slam and in 1993 he toured again with the Lions in New Zealand, playing in all three Tests. Two years later he captained Leicester to the League title and played in his final World Cup as England reached the semi-finals in South Africa. He played his last international in the Five Nations in 1996 when England beat Ireland 28-15 at Twickenham and he retired two years later from playing all forms of rugby to take over from Bob Dwyer as coach at Leicester. His reign started perfectly with four successive Premiership titles as well as two consecutive Heineken Cup trophies but he was sacked in 2004 after a poor season. Richard was so hurt by the decision that he requested that all of his memorabilia be returned by the club and that 'Deano's Bar' at Welford Road be renamed. Following that setback he has had a troubled spell coaching French club Grenoble before linking up with Harlequins, He later took on the role of Director of Rugby having led them back to the Premiership following relegation in 2004. His tenure ended in the summer of 2009 in the wake of the fake blood injury controversy that stemmed from their Heineken Cup quarter-final loss to Leinster during the 2008-09 season. Misconduct charges against Richards were dismissed by an independent disciplinary panel but the club, that was fined £215,000 (later raised to £259,000), accepted his resignation as part of an internal review of the incident. However, on appeal he was banned from all European rugby for three years for his involvement in the affair and this ban was later extended worldwide by the International Rugby Board. In March 2012, after being linked with several roles, Richards confirmed that he would be taking over as Newcastle Falcons director of rugby when his ban expired in August.